In 1972 the Miami Dolphins did what no other team had ever done before AND what no other team has ever done since. They ran the table. They were perfect. They were 17 and 0. Yes, I know, I used those exact same words to begin my first article on The Perfect Season. But those words are extremely important to those of us who witnessed Absolute Perfection. It is something young Dolfans should always remember. It is something old Dolfans will never forget. The Perfect Season is the source, the very essence, of Dolphin pride. It is what separates us from the fans of every other team in the National Football League. Breathe it! Eat it! Sleep it! The Perfect Season is OURS TO ENJOY!! The Houston Oilers dominated the early years of the American Football League. They had high profile super stars, such as legendary quarterback and placekicker George Blanda and Heisman Trophy winner Billy Cannon. But they also had ace wideout Bill Groman from division III Heidelberg College. Groman led the AFL in receiving in 1960 with nearly 1500 yards and a 21 yards per catch average. Fullback Dave Smith, from tiny Ripon College, keyed the running game along with Cannon. The Oilers won the very first AFL Championship Game 24-16 over the Los Angeles Chargers (led by future vice presidential candidate Jack Kemp). A year later, in 1961, Houston defeated the now relocated San Diego Chargers 10-3. Houston’s attempt at a “3-Peat” failed when they lost the 1962 AFL title game to Lamar Hunt’s Dallas Texans 20-17 in a double overtime thriller. Humt subsequently moved the Texans to Kansas City where they became the Chiefs in 1963. The Houston Oilers team that took on the Dolphins the second week of The Perfect Season was a far cry from the juggernaut Oilers of the early 1960’s. Both George Blanda and Billy Cannon were shipped to the Oakland Raiders. They were replaced by a group of ragtag misfits who would produce a 1-13 record in 1972. The only star on this Oiler’s team was future Hall of Fame receiver Charlie Joiner. Miami head coach Don Shula was taking nothing for granted. He was intimately familiar with the “On Any Given Sunday” credo. His totally unexpected loss as head coach of the Colts to the upstart Jets in Super Bowl III still ate at his belly. And his lopsided loss in Super Bowl VI to the Cowboys was still fresh in his mind. Shula decided he would take out some of his frustrations on this outmanned Oilers squad. Shula was pleased with Miami’s ground game in 1971. Csonka and Kiick were outstanding. But Shula wanted more, much more. So he made heavy use of speedy Mercury Morris during the 1972 preseason. Morris responded with several spectacular long runs. The Don of Miami thought the Houston game would be the perfect time to spring Morris on the National Football League. Shula’s timing was just right. The “Three Back Offense” made its first appearance in game #2 of The Perfect Season. Morris ran 15 times for 94 yards and a touchdown. Csonka had 17 carries for 79 yards and a score while Jim Kiick ran 9 times for 55 yards and a TD. The result was a team record 17 first downs rushing for 247 yards on the ground. Jim Kiick was the first runner to benefit from the “Three Back Attack.” On the game’s second play Miami’s Vern Den Herder crushed Houston’s Hoyle Granger, forcing a fumble. Bill Stanfill recovered at the Houston 14. Two runs by Kiick produced the game’s first score after just 1:43 of playing time. On Houston’s second series quarterback Dan Pastorini attempted an ill-advised quick-kick. Miami’s Jim Mandich recovered the botched play fumble at Houston’s 30. Three runs by Morris produced the game’s second touchdown and Miami led 13-0 after Yepremian shanked the PAT attempt on the wet artificial surface. In the second quarter Bob Griese tossed a perfect deep pass to Paul Warfield good for 39 yards to the Oilers 10. 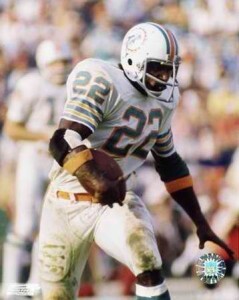 A six yard burst by Kiick was followed by a four yard touchdown run by Csonka and Miami led 20-0 at the half. Combined with Miami’s 17-0 halftime lead at Kansas City in game 1, the Fins had now out scored their opponents 37-0 in the first halves of their first two games. Miami seemed to take complete control of the game when they roared down the field during the first few minutes of the third quarter. Griese capped the 76 yard drive with a two yard TD scamper and the Dolphins led 27-0. Not to worry. The “Three Back Attack” had the remedy for Shula’s unsettled stomach. A 16 play 93 yard drive consuming over seven minutes of the clock was just what the doctor ordered. 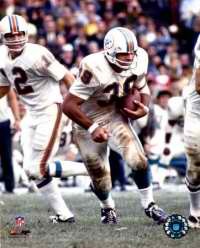 Csonka carried the ball four times. Morris had three carries. Griese completed key passes to Paul Warfield and Marv Fleming. The drive ended when Griese tossed a perfect 6 yard TD pass to Jim Kiick in the left corner of the end zone. Yepremian’s conversion on the rain slicked polyturf surface gave Miami a safe 34-13 lead. Some wondered “Would all 3 members of the Three Back Attack gain 100 yards?” Not on this slippery day. Shula wisely replaced his starters with back-up runners Hubert Ginn and Charlie Leigh. For just a few minutes Shula allowed his team to enjoy their victory over an outmatched Oilers team. Then, he turned his attention to next week’s challenge. He knew his Dolphins would be underdogs on the road at Bud Grant’s Minnesota Vikings. Yes, there was trouble on the horizon. The 1972 Miami Dolphins were now 2-0. While I’m not a scout or NFL coach, haven’t played one on TV, and didn’t stay in a Holiday Inn Express last night, I will sya that I’ve liked what I’ve heard about Cunningham. However, watching the highlight reel that Mike posted I noticed he has a propensity to tackle high, eithernat the shoulder or above the waist and then spin the runner down. Not sure how successful that will be against NFL players. Too many accounts – Got moderated. Almost like the Offspring… “Gotta keep’em mderated..”While I’m not a scout or NFL coach, haven’t played one on TV, and didn’t stay in a Holiday Inn Express last night, I will sya that I’ve liked what I’ve heard about Cunningham. However, watching the highlight reel that Mike posted I noticed he has a propensity to tackle high, eithernat the shoulder or above the waist and then spin the runner down. Not sure how successful that will be against NFL players. Nice writeup OD. Soon enough our championships will no longer be a distant memory. We’re building a new NFL dynasty. These are cool write ups of our heyday, let’s hope we have a great season sooner than later. Like Tim said, great write ups, and reminders of a time when this franchise had a team that was competitive and either at the top, or near the top for a long time. I think we’re at least relevant, which is a big step up. Now we have to be there consistently, and improve on last year’s record, and go farther into the playoffs. It would also be phenomenal to be the team that knocks the Patriots off in our division, and win a division title! I’m not for any F/A OL. I think we are in great position to solve the OL problems that have poisoned this franchise the last 10-12 yrs. Our OL can be set with the draft of just a second or third rounder and then the OL can replace the expiring OL contracts with Cheap 5 yr rookie contracts in future drafts. Our salary cap will go down greatly during this plan of yrly expiring contracts during the next 4 yrs. At present we have all 5 starters who could start at different OL positions. We may be able to snag best center in 2nd or 3rd round depending how draft unfolds. JUST GOT BACK from a convention in Charlotte. The convention suffered from a murder in the neighborhood on Friday night. This resulted in greatly diminished public attendance on the weekend at the convention. To put it mildly, race relations in Charlotte are somewhat strained. HERD! – – Thanks for running game 2 of “Absolute Perfection.” And the photo was neat, too. –I can NOT state strongly enough the key role Miami’s offensive line played in the big playoff run from 1970 through 1974 (5 seasons). 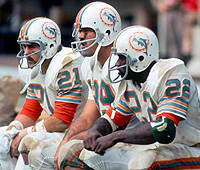 The Dolphins’ O-Line was the very best in the entire NFL in both 1972 and 1973, and by QUITE A MARGIN!! and not a single DRAFT CHOICE WAS USED ON ANY OF THE STARTING FIVE. –GM Joe Thomas was a wizard at taking free agents and making trades!!! I believed then as I believe NOW; you CAN’T win a Super Bowl unless you have a very strong and reliable offensive line. And, currently, we don’t have one YET. But I DO EXPECT them to address this issue successfully this off-season. Back to the Perfect Season. The #1 issue facing Miami’s opponents in 1972 was “How do we stop the run?” Some did it fairly well. Most failed miserably. And when the Dolphins ran as they did against Houston, they were UNSTOPPABLE!! Offensive coordinator Howard Schnellenberger is, by nature, an advocate of the pro-style offense with an intricate passing game as his foundation. But, in these years, he was smart enough to realixe he had a once-in-a-lifetime opportunity to literally “RUN TO GLORY.” AND HE DID IT VERY EFFECTIVELY!! During Miami’s incredible two year “RUN TO GLORY,” the Dolphins had the greatest running attack in NFL history up to that time. And when Howard left the Dolphins in early 1973 to become head coach of the Colts, Miami continued to build on the foundation Howard had set for this fabulous running game. I consider Schnellenberger one of the greatest teachers in history on both the pro football and college football landscapes. He has earned my utmost respect!! HOPE ALL OF YOU ENJOY this look back into the one and only PERFECT SEASON. The lesson I took from this game is that Joe Thomas and Howard Schnellenberger did one helluva job building this team’s offense!! ENJOY, ENJOY, ENJOY!! – – Talk to you tomorrow. Report: Eagles will attempt to trade LB Mychal Kendricks this offseason. I’ve been talking about trading for Kendricks for 2 yrs. Now I can care less. I’d rather Hicks. Dolphins and Kenny Stills working on extension. I’m hearing $6.5 million per year is where it will end up. If Kendricks is traded by Philly his bonuses accelerate to this yr &Philly eats them. That leaves acquiring team w/only $4.35m on contract. that makes Kendricks a pretty good bargain in a trade from a contract point of view.